Love makes the world go round. Shakespeare knew that. Shakespeare used love stories to drive the action, in his comedies as well as in his serious plays. In fact, most of his comedies are about the complications of love and the mistaken identities, miscommunication and other mistakes that get in the way. From the silliness of Much Ado About Nothing to the high tragedy of Romeo and Juliet, Shakespeare shows us how love continues despite everything that gets in its way, even death. William Shakespeare is considered the most famous writer in the English language. In sixteenth century England, he wrote plays, sonnets and verse that entertained the British nobility and amused the groundlings, the commoners who found standing room at the theatre. Shakespeare’s influence has only grown over the centuries. His most famous plays, including Hamlet, Othello and Midsummer Night’s Dream, are still performed today. Sometimes they are performed in the original Renaissance costumes. Sometimes, they are updated to modern times. Shakespeare’s language seems old-fashioned to us now and are a little hard to follow. His best quotes, though, are witty and profound even today. To consider the many colors and moods of love, here are ten of the best Shakespeare quotes on love. We have included an interpretation with each quote, which describes the importance of the quotation to the story of love. Read these quotes to feel inspired, and share them with those you love and those who love you in return. You will find truth, beauty, passion and high ideals in the words of Shakespeare about love. It doesn’t matter whether the verses, written centuries ago, remind us of historical times or are spoken as if invented in the present moment. Shakespeare was an actor himself. He knew that his verses are for the ages. 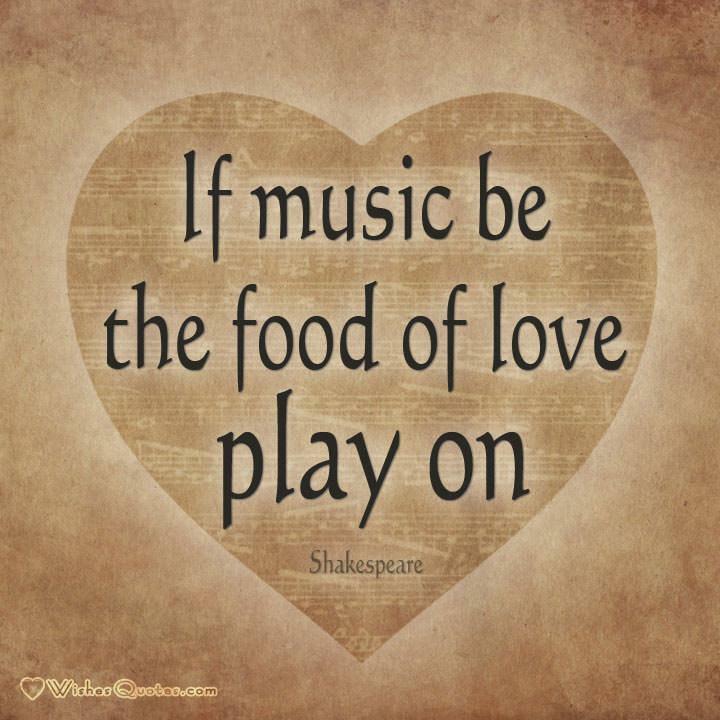 “If music be the food of love, play on” Twelfth Night – Act 1, Scene 1. Music puts us in touch with our emotions. If we want to create a loving atmosphere, if we want to put someone in the mood for love, we put on the kind of music that makes us feel intimate and close. We hope the other person will feel the same way. The course of true love never did run smooth” A Midsummer Night’s Dream – Act 1, Scene 2. Love creates a tremendous attraction and a desire for the love to be returned by the beloved. Passions run high. Small slights and minor obstacles seem overwhelming. Love is never easy. She’s beautiful, and therefore to be wooed; She is woman, and therefore to be won” Henry VI Part 1 – Act 5, Scene 2. Love sees beauty in the beloved. Beauty is to be treated gently. The lover must also show strength and the ability to overcome obstacles to win the beloved’s hand. 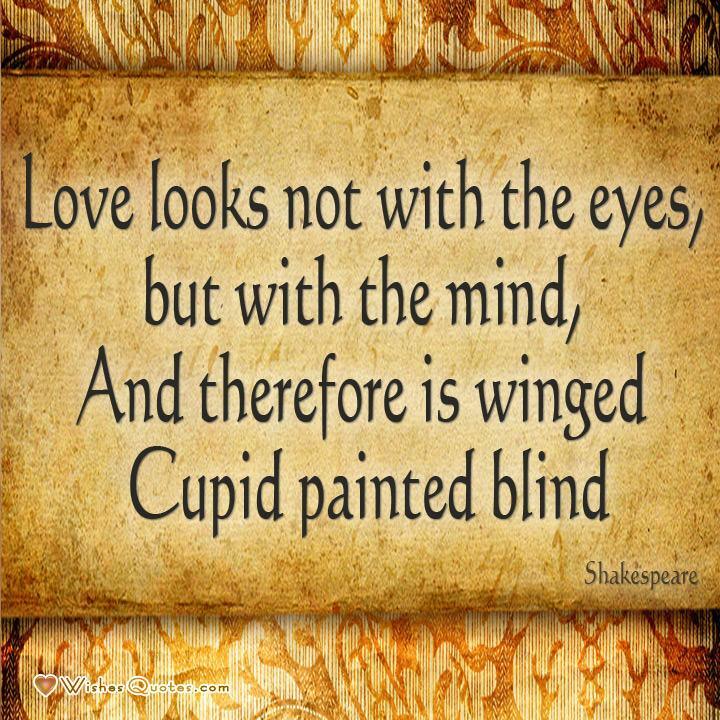 “Love looks not with the eyes, but with the mind, And therefore is winged Cupid painted blind” A Midsummer Night’s Dream – Act 1, Scene 1.When you fall in love with someone, you see him or her as an ideal. All you see is the good that attracts you. You are blind to the faults of the beloved. “Love sought is good, but given unsought is better” Twelfth night – Act 3, Scene 1.The highest love is love that is given freely. You can seek to win love, but in the end you cannot force someone to love you. Love does not bargain. “Come what sorrow can, It cannot countervail the exchange of joy, That one short minute gives me in her sight” Romeo & Juliet – Act 2, Scene 6. The sorrows of love come from being separated from the loved one. The moment the lovers are reunited, their joy in each other’s company makes them forget the pains of separation. Love at first sight is real. When we fall in love, we surrender. Love makes fools of us all. True love is constant in its affections. True love prefers the beloved over all others and finds safety and security in his or her company. Love inspires great poetry. Singers have sung heartbreaking songs about love for countless ages. 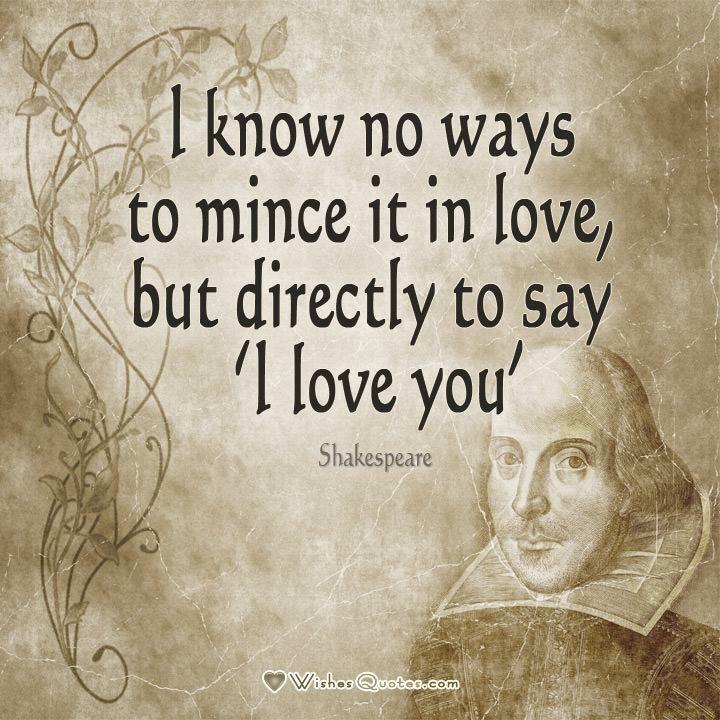 Sometimes, though, the simple, direct statement that “I love you” says as much as Shakespeare’s most beautiful sonnets. Love reigns supreme. A king can have countless riches, kingdoms and fame. Without love, none of it matters. With love, everything, however simple, is beautiful. Love grows over time. Young love is as beautiful as a rosebud. Mature love opens its petals and fragrance to the enjoyment of the entire world. 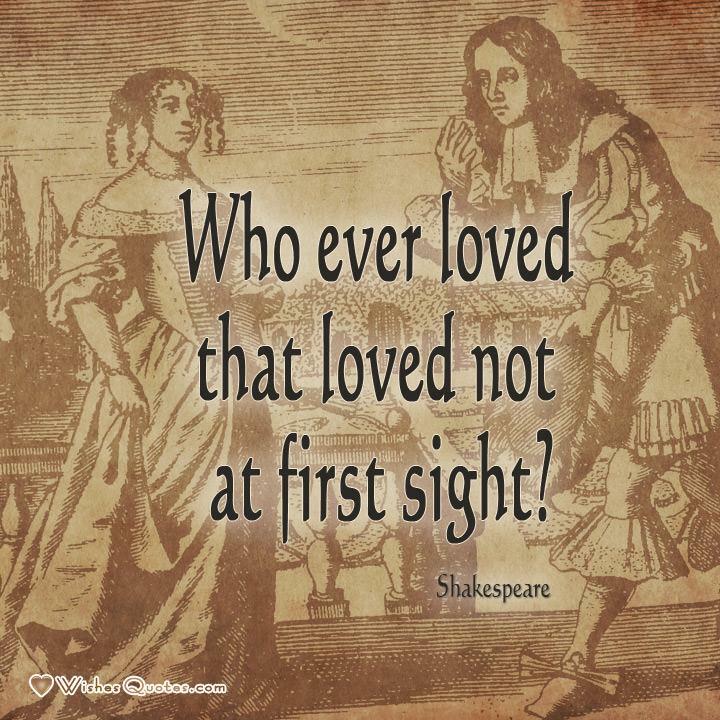 What do you think of the these famous Shakespeare love quotes? Let us know or tell us your favorites in the comments section below.